Reported widely on the internet, this is from a story appearing in the NY Times on Friday. Remarks by its foreign minister this past month were the latest sign that another country had withered under pressure from China over the contentious issue of the Dalai Lama, the Tibetan spiritual leader. The minister, Tsend Munkh-Orgil, told the Onoodor newspaper that the government “feels sorry” for allowing the Dalai Lama to visit Mongolia in November and that the Dalai Lama “probably won’t be visiting Mongolia again during this administration,” according to Bloomberg News. The Foreign Ministry confirmed the remarks, according to The Associated Press. The reaction by Mongolia surprised some scholars because of the country’s deep ties to the Dalai Lama, which date from the 1500s. Even the title alludes to those roots: Dalai means “ocean” in Mongolian. • Read the entire article here. Q: You get to see news from around the world, and you get to see now that Tibet is now is flushed with wealth and there's so much of material comfort. Do you think Tibetans are forgetting the cause? Karmapa: Maybe not. Of course, they have lots of material progress, material development there. One way for the people it's more satisfying that there's only material development. What they need is more internal freedom They can have more access. They can have a sort of basic freedom and freedom of religion and freedom of speech and everything. I think those are very important sort of matters you could say … I think material development can bring some temporary comfort and temporary sort of satisfaction, but if people need more long term sort of happiness and more long term satisfaction, then they need more. More than material development. Dan Harris speaks with His Holiness The Dalai Lama and Richard Davidson, a neuroscientist who has looked at the impact of meditation on the brain, in this 25 minute podcast. 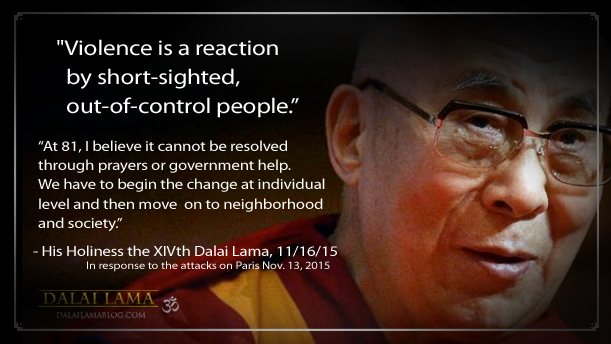 His Holiness the Dalai Lama on Sunday condemned the series of terror attacks in Paris on Friday, which killed over 130 people. “Violence is a reaction by short-sighted, out-of-control people. At 81, I believe it cannot be resolved through prayers or government help. We have to begin the change at individual level and then move on to neighborhood and society,” said the Tibetan leader. 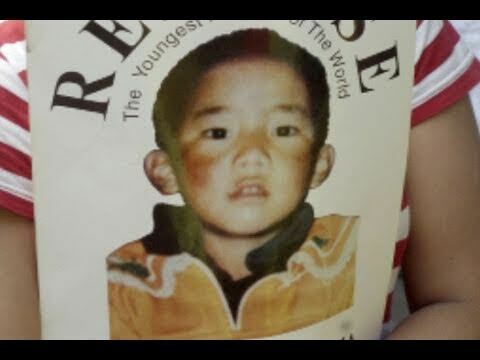 [Reuters 14 Sept. 2015] The Dalai Lama said on Monday more research was needed to settle the fate of the man he named as the Panchen Lama, the second-highest figure in Tibetan Buddhism, who vanished two decades ago but is said by the Chinese to be living a normal life. "Some friends say that my Panchen Lama is still alive (...) and he has also had the opportunity to make a family," the Dalai Lama said. 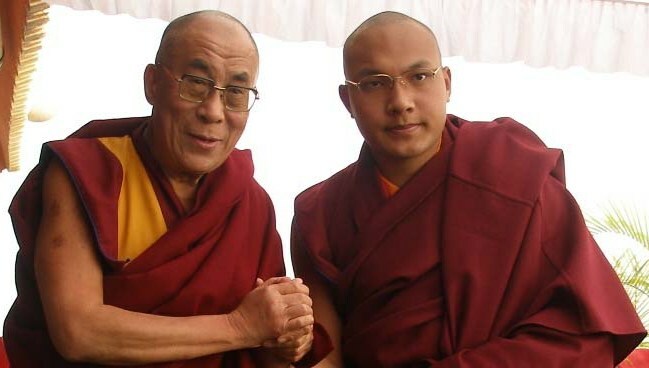 Since 2005 our purpose has been to offer a collection of news about HH the XIV Dalai Lama and HH the 17th Gyalwang Karmapa, as well as general news and information relating to Buddhism and the China-Tibet relationship. Stop by frequently here, or join us on Facebook and Twitter, for news from Dharamsala and around the world. Yes. 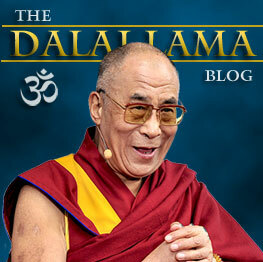 When we started our blog back in 2005, the Dalai Lama had not yet made more than sporadic appearances on the internet. His domain resolved to a placeholder that contained outdated information, and Facebook and Twitter were both still up and coming. With the advent of a robust website by the office of the Dalai Lama our work has diminished somewhat, although we will continue to make periodic posts to help spread news and teachings of this remarkable spiritual leader. Tibetsites.com was developed to help both Tibetans and non-Tibetans find websites about Tibet. The official web site of the Central Tibetan Administration. 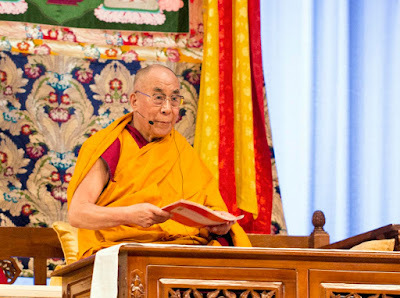 Advancing the Tibetan cause and the vision and leadership of the Dalai Lama. We have opened a premium Cafe Press store, consolidating most of our designs under one roof and adding a new sets, including SYMBOLS OF FAITH. The store features our Christianity-themed sets along with the recently added Buddhist-themed sets: FREE TIBET and OM MANI PADME HUM. We would like to welcome all people from all countries who have visited this site. All other content, including comments and quoted passages, are owned by the original author(s). Our site has no affiliation with the Tibetan Government, or His Holiness The Dalai Lama.